Actually the title of this blog post is misleading but don't sue me. It's really not stemware. It's short, but there's no stem - which is the main reason why it is short. Normally I don't like to drink wine out of a glass that has no stem. This latest trend towards stemless glasses is not popular with me. Nevertheless, I ended up buying a couple of stemless glasses recently. I couldn't resist. They had a nice shape and they cost only $1.50 each. 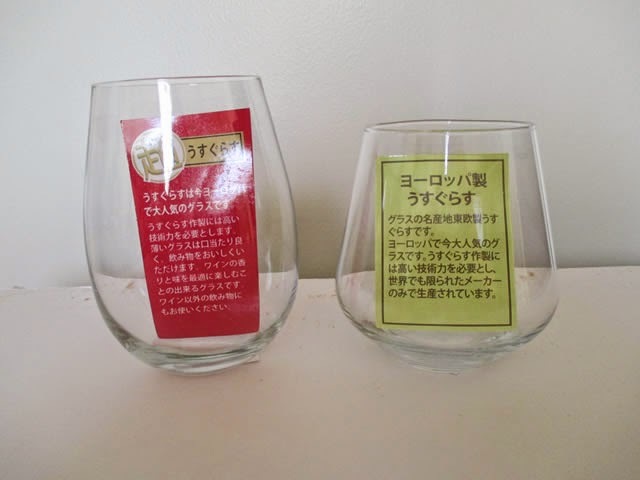 I found them at Daiso, which is sort of the Japanese equivalent of the 99 Cents Only Store that is so familiar to us. Unlike the 99 Cent store, however, there are items of various prices although most are $1.50 and all are pretty cheap. 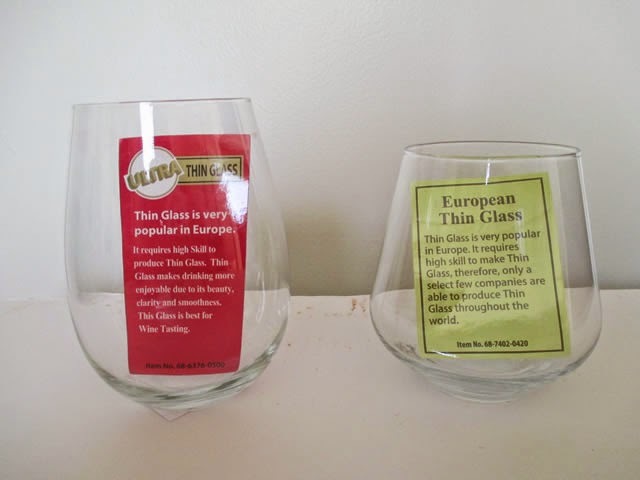 The shapes initially attracted me and when I saw the little insert that said it was "European Thin Glass" and even better, "Ultra Thin Glass," I couldn't help but inspect them. No Libby's soda bottle bottom thickness glasses here! These are thin and light. Being that they cost only $1.50, I don't have to be paranoid when washing them, either. I plan on using them when (if) the weather gets cold. So far this summer has been so hot I expect it to only trail off slowly in the winter before getting hot again. It's ridiculous! I'm a sucker for a nice wine glass. And a nice glass of wine.